With an attendance of roughly 19,000, the second Royal Rumble event marked the first time WWE produced it as a PPV special. It included it’s own graphics, and was the main event of the card. The match had a slight change in the rules, with 30 wrestlers competing instead of 20. It was determined anyone could enter the match (even the WWF champion), and there were no rules (other than needing to be eliminated over the top rope). Also, there was still no reward for winning it other than bragging rights. The undercard included three matches. King Haku took Harley Race’s crown and cape in a match where they fought over ownership. The Hart Foundation and Jim Duggan defeated The Fabulous Rougeaus & Dino Bravo in 2-out-of-3 falls. Rockin’ Robin defended her title against Judy Martin, however, it was the last time the WWF Women’s title would be featured on PPV for almost five years. Robin left the promotion, and due to there being little interest in women’s wrestling, WWF deactivated the title indefinitely in the summer. The Rumble lasted over an hour with 30 competitors; and featured more stars than the previous year. Gorilla Monsoon and Jesse Ventura are your commentators for this match. Finkel looked excited to be announcing the stipulations. The commentators had a similar approach, as both Monsoon and Ventura shared how much they liked the concept, as well as how disappointed they were to not be involved in the action. Ax of Demolition started us off, with his tag team partner Smash surprising everyone by starting second. Some tag teams might take this time to relax, but both Ax and Smash seemed keen on taking each other out. It didn’t last long, as Andre The Giant made his presence known in his first Rumble. As predicted, Demolition teamed up to take him out. Mr. Perfect showed up next, and helped Demolition with Andre. Shortly after, The Giant eliminated Smash with ease. Ronnie Garvin next, who didn’t last long thanks to Andre. Greg Valentine showed up and hung around a while. Jake Roberts! Crowd popped as he rushed down to attack his nemesis Andre. But after only 2 minutes, Andre eliminated him. Groan. A young “Rockers” Shawn Michaels showed up as number nine, and he looked great! Quite the performance indeed. Bushwacker Butch, Tito Santana, Honky Tonk Man and Bad News Brown entered. Both Butch and Tito got large face pops, while Honky and Bad News were jeered more than anyone .. except perhaps for one instance. Jake Roberts popped up with his snake, and threw it in to the ring. Andre got scared and eliminated himself! Ax and Honky Tonk were dumped not long after. Marty Jannety! The Rockers united and got rid of Ron Bass. WWF Champion Randy Savage!! And he went straight for Bad News Brown. Arn Anderson up next, and he seemed focused on taking out The Rockers. What did it take to eliminate Shawn Michaels? The combined effort of Arn Anderson and Randy Savage. The trend of tag teams coming out one after another continued, with Tully Blanchard making his way down to the ring. Anderson & Savage got rid of Santana as well. Hogan time! He got in the ring and man .. he took over. As one half of The Mega Powers, Hogan stayed away from Savage and eliminated Bad News Brown and Mr. Perfect. Hogan got on a roll, eliminating Tully Blanchard, Bushwacker Luke, Koko B. Ware, and The Warlord in record time. Savage was trying to get Anderson out. Hogan came to help and appeared to accidentally eliminate Savage as well. Macho Man was irate, you could see the vein sticking out of his head. He got in the ring (only Hogan left in the match at this point) and started angrily pointing at Hogan, telling him he did it on purpose. Miss Elizabeth got in and tried to separate the two, and eventually Savage calmed down and shook Hogan’s hand. He and Elizabeth had to vacate the ring, as Big Boss Man was coming. Hogan and Boss Man fought til his partner in The Twin Towers Akeem made his way down the aisle. I was really surprised when Boss Man and Akeem eliminated Hogan. The crowd were shocked, but Hogan got payback by getting in the ring and eliminating Boss Man. As we got Brutus Beefcake and The Red Rooster, the match slowed considerably and I found myself waiting for something to happen. The ring filled up again, as the last five entrants entered: The Barbarian, Big John Studd, Hercules, Rick Martel & Ted DiBiase. DiBiase did well, eliminating (with some help from The Barbarian) Beefcake, Rooster, and Hercules. Studd and Akeem were not to be messed with though. Eventually, Studd managed to dump Akeem despite DiBiase’s best efforts to stop him. This left Studd and DiBiase, so DiBiase offered him money. Studd declined, and struck DiBiase. After some back and forth, Studd threw DiBiase over the top rope and won the match! Virgil jumped in, but failed to take him out. 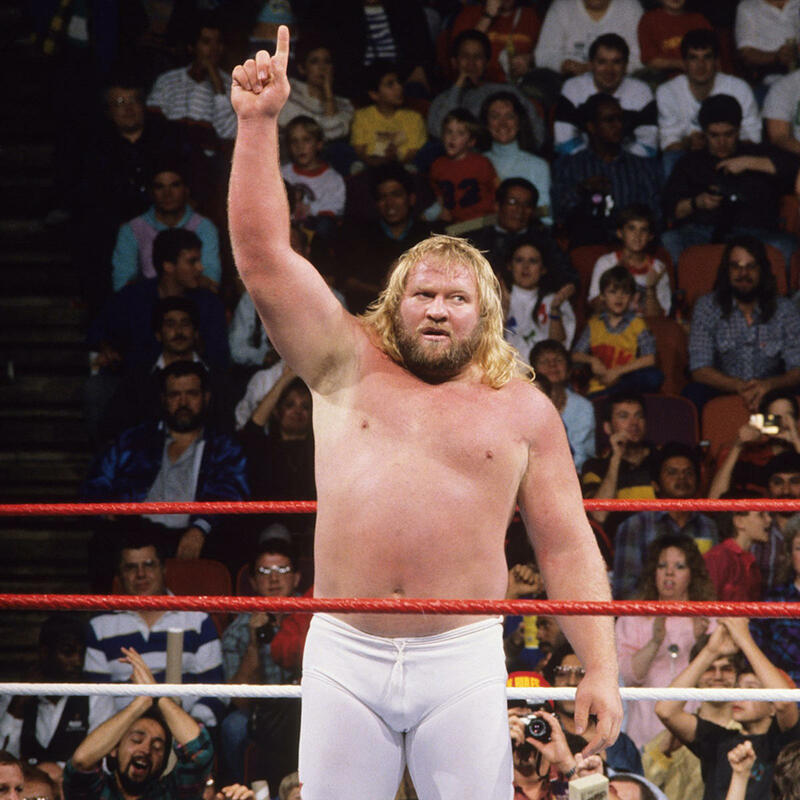 Big John Studd stood tall and celebrated being the winner of the first Rumble on PPV. Big John Studd: He worked with the WWE from 1972. His biggest success came in the Mid-Atlantic in 1982, gaining several unsuccessful NWA title shots against Ric Flair. He also won the WWF Tag Team title as #2 of The Executioners in ’76. His biggest feud in WWF was against Andre The Giant, which culminated in a Bodyslam Challenge match at the first Wrestlemania. A few months after his Rumble win, Studd decided to leave the WWF because he felt he wasn’t getting paid enough. He worked on the independent scene, til he stopped wrestling by the end of 1989. Sadly for John, he contracted a large tumour in his chest in 1993. He recovered, but in 1994 his lungs collapsed and went back to hospital. He recovered once more, but in 1995 he died at the age of 47 from liver cancer and Hodgkin’s disease. He was inducted in to the WCW Hall Of Fame in 1995, and the WWE Hall Of Fame in 2004. He had a long career, often remembered through this memorable victory. He should always be credited as one the pioneers of Wrestlemania and the Royal Rumble match. Conclusion: I enjoyed Rumble #2. Seeing the legends square up is always a delight. There’s a few records to share, which I’ll list below. Highlights include Hogan and Savage planting the seed for them to break up going in to Wrestlemania, and the surprising Hogan elimination by The Twin Towers. Honourable mention to Mr. Perfect and Shawn Michaels, who were oozing with charisma and athleticism. Also Andre eliminating himself? Hilarious. The only downfall was the downtime after Hogan left ringside; otherwise it picked up at the end. 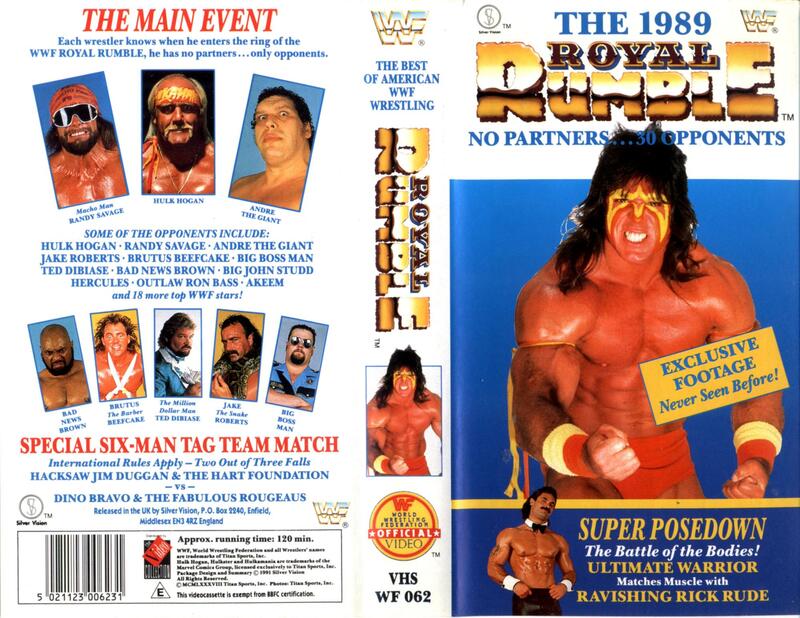 Recommended to see the first Royal Rumble on PPV. Thanks for reading! Hogan set a new eliminations record with 9. The Warlord set the record for short time spent in the Rumble: Only 2 seconds before being eliminated by Hogan. Mr. Perfect set a new record for longest time spent in the Rumble with 27 minutes 58 seconds, beating Bret Hart’s record. It was the first time the WWF Champion participated in the Rumble. Miss Elizabeth was the first woman to be in the ring during a Rumble. Only three competitors made their second Rumble appearance: Tito Santana, Jake Roberts, and Ron Bass.